Of all the proposals put forward by the wild-haired comedian turned populist politician Beppe Grillo during the run-up to Italy's elections in February, one stood out as the most controversial: his insistence that Italy hold a referendum on whether the country should give up the euro as its currency. After all, Rome had just spent the previous 15 months doing everything possible to hold on to the euro  tasking a technocratic government with implementing unpopular tax hikes and reforms, amid fears that an unruly exit by the euro zone's third largest economy would bring down the entire currency union. Grillo's proposition was easily dismissed by the country's political and media establishment, providing ammunition for opponents eager to paint him as dangerously misinformed. But Grillo was, in fact, tapping into something real. More than half of Italy's voters chose candidates who explicitly rejected austerity measures widely seen to be imposed by German and other European bureaucrats and bankers. Last week, while attending a campaign rally for a candidate in local elections, Grillo, now the head of the country's largest opposition party, again called on Italy to hold a referendum next year. "No person, no party, can claim the right to say yes or no on such an important issue that involves 60 million people," he said. This time, with Italy's new coalition government showing no sign of enacting measures needed to sustain the euro zone, he shouldn't be ignored. The process of creating and shaping the European Union has rarely been truly democratic. In a recently published 2002 interview, Helmut Kohl, the former German Chancellor, admitted that his country would never have adopted the euro if its voters had been consulted. After nearly 70 years of peace in Western Europe, the foundational motivation for the E.U.  the prevention of another world war  has lost much of its resonance among citizens that have never heard the rolling of tank treads in their streets. But the alternative argument, that an ever closer union promotes economic prosperity, is nearly as difficult to sell to a generation suffering from recession, record unemployment and shrinking standards of living. The steps necessary to bring the dysfunctional and imbalanced currency union into economic harmony are deeply unpopular. In Europe's less competitive countries like Italy, Greece, Spain, Portugal and Ireland, they mean rebalancing the books and rethinking a way of life. For the continent's strong economic core, in the north, they include accepting higher taxes in order to support weaker, less productive neighbors. The result has been an explosion of popularity for Euroskeptic politicians across the continent. In Greece, recent polls put the radical leftist Syriza party at the head of the pack. In France, support for the far-right politician Marine Le Pen has surpassed that of President François Hollande. In Italy, where Grillo has been the main beneficiary of Italian Euroskepticism, the only priorities on which the country's new broad coalition government seems to be able to agree are the suspension and possible abolition of some of the unpopular taxes introduced at Brussels' request last year. As long as European policy is perceived as the domain of a faraway elite, the measures needed to preserve the currency union will remain unlikely to gain approval in many European parliaments. A referendum in Italy would force politicians  all across the continent  to make a clear case for the European project, and require those arguing for its dissolution to spell out the alternatives. To be sure, the prospect of Italy's return to the lira would rattle markets. But it would put the responsibility for the decision back where it belongs: with the voters. 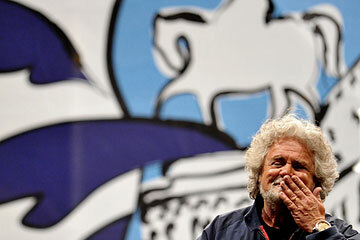 Italy would be a useful bellwether for all of Europe; the country has long been one of the continent's most Europhilic. In a recent poll by the Pew Research Center, 58% of Italians said they had a favorable opinion of the E.U. Providing the country's citizens with a say in their future would require them to take ownership of the costs  as well as the benefits  of their place in the euro zone. A vote to abandon the currency would bring a mercifully quick end to what might otherwise be a slow, agonizing divorce from the currency. A decision to stay would do just the opposite. It would provide legitimacy to reformers and put Italy on the path toward rebalancing its economy  only this time with popular consent.